As I’m sure you’re aware, I’m a lover of everything dark, luxurious and Halloween-y. You may also know that I’m also one of Regal Rose‘s biggest fans, having bought from them & worked with them for years! Not so long ago, one of the most exciting emails I have ever received landed in my inbox. After a phone call and some schedule reshuffling, it was official – one of my favourite brands had commissioned little ol’ me to create their Halloween campaign imagery! So I present to you – one of the most exciting things I have had the honour of creating – the Regal Rose Halloween Collection campaign! The pieces are just insanely beautiful – you can check out the whole collection here. I featured whole collection across all of the images, so please feel free to scroll down & take a peek! Anyway, please excuse the rambling! 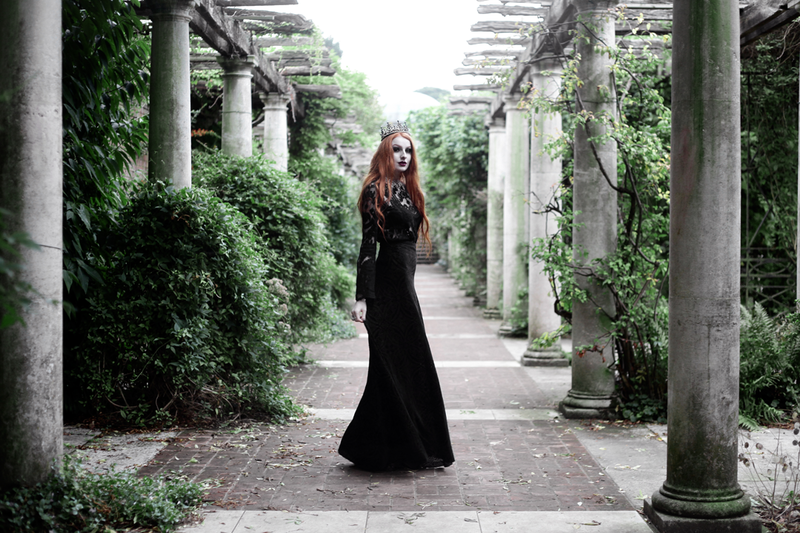 You can check out the Regal Rose Halloween campaign images below – I’d love to know what you think. Which is your favourite piece? While I adore the crown, my other favourites (the serpent necklace and moon earrings) are probably more everyday-friendly! 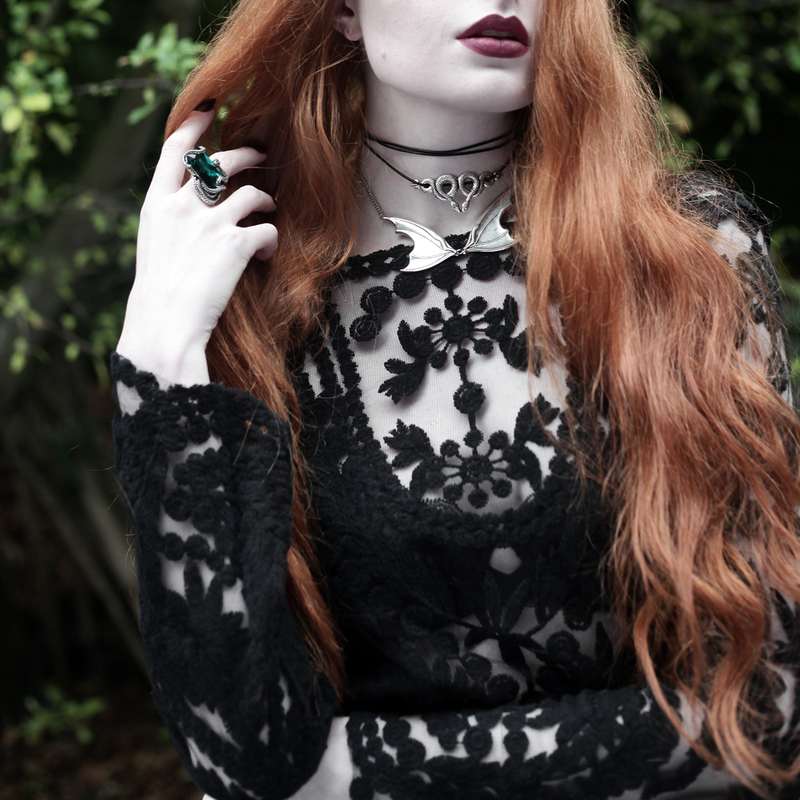 All clothes worn are Black Milk Clothing, apart from the lace top (which is super old)! Next Post Halloween Week – Crushed Velvet. Oh my glob. That bat choker and ring. I think I may be hyperventilating. This is so cool! The pictures are absolutely stunning! You did a terribly good job! I would wear that crown for the rest of my life (it goes with everything). 😉 I looooove the Eclipse Crescent Moon earrings! So delicate yet ‘making a statement’ (and, as you demonstrate, they go perfectly well with the crown!). Stunning! You look like one of the characters in a fairytale movie. OH MY GOODNESS. these are beautiful. I may not look it, but I’ve always had a soft spot for the morbid and the macabre, and these gorgeous pieces certainly hit the spot. I would honestly want a wedding dress like the dress you have on. Except in white. Those rings– especially the serpent and bat ones– Oh my gosh. Beautiful. PS I’m obsessed with that dress! Congrats on getting to shoot the campaign! It's so awesome to see one of my fav bloggers team up with one of my fav jewelry brands!